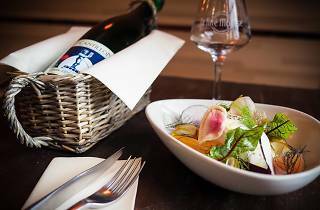 Refined dishes matched with the best craft beers. One of the first dedicated craft beer bars in Paris, hugely popular hangout La Fine Mousse has found a novel way to introduce Parisians to great beer. Its restaurant pairs the brews with some equally excellent food in a simple space with long wooden tables. The portions are generous and filling, although sadly vegetarians aren’t catered for. We began with a half-pint of Taras Boulba, a Belgian pale ale with a lovely aroma, and Grand Paris’s A l’Ouest, fragrant with a slight taste of grapefruit. 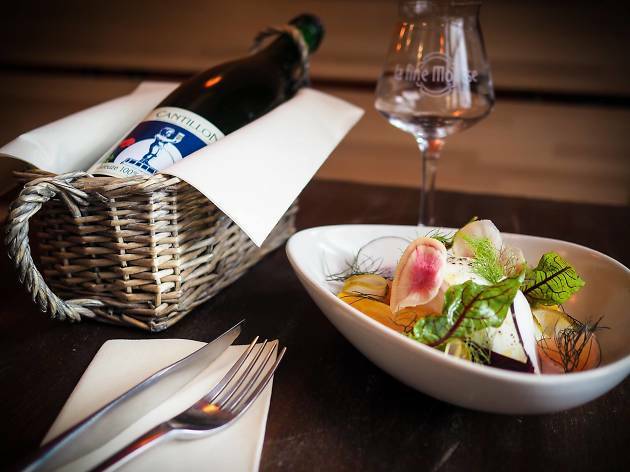 The beers paired perfectly with our plate of roasted potatoes served on a bed of fromage frais. Next up we ordered the chuck steak, made with aged beef sourced from one of the Marché Aligre’s top butchers, and the smoked veal served with sage, vegetables and a chorizo emulsion, along with glasses of Stout. The meats were both fantastic but the veal was the favourite, with its lingering smoky aftertaste. The dessert course doesn’t come with a beer pairing, but the Madagascan chocolate mousse and Sicilian lemon cream with meringue are just fine by themselves. A winner.